Battery-powered devices are comfortable to use but have also some major issues. Especially during the development, some important aspects must be taken into consideration, unfortunately it is not just replacing the power plug. In the first episode of my new series, "IoT Use Case", I want to focus on the topic of "battery-powered devices" and give you some of my main take aways from the experience I was able to gain in real projects. Internet of things and connected devices essential idea is to connect easily everything to everything or at least to a joint control center to gather the data and derive or gain new knowledge from the data to make our environment more intelligent/efficient. The concept of purely battery-powered devices fits perfectly with this idea, especially if you want to fulfill the requirement "easily". Just an example. Besides all concerns about the ecologic footprint, waste etc. which are fully relevant in the case of batteries, just think about any device on the market. Now imagine you can use this device with a cable or without and think about the gain of comfort if no cable is available. To be honest, I guess there are very few examples where someone will buy a cabled device if the usability of the one without batteries is comparable. With usability, I don't mean a nice user interface but the holistic usability like e.g. battery lifetime is enough for 90% of your use cases, response time to your inputs is less then 400 ms, connectivity is available if you need to send or receive data etc. Below I summarized some important engineering topics which shall be considered during the development of battery-powered IoT device to let you focus on the usability part and create more great devices for the market. As an intro to the topic, I want to show you some battery powered device which is available on the market to show the diversity and describe shortly the characteristic differences. As we will see below, the products target different market segment with different requirements and also different solutions. For every of them, an alternative battery concept fits better, some can be easily recharged after some days because it is accepted by the user that devices of active daily usage must be recharged. Others are working according to the principle "equip and forget". 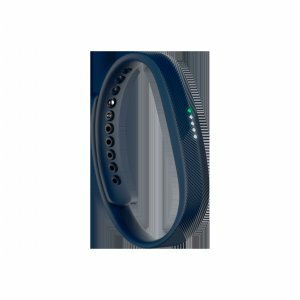 Let's start with one of the more popular ones from the consumer domain, the Fitbit wristband, activity tracker is also available as a smartwatch. Besides the motion detection and tracking functionalities, Fitbit has also some comfort functions e.g.leds are blinking to visualize an incoming call. But the comfort functions are not in the scope of this article, but the main functions are. max. 70 °C - if the device was forgotten in Miami in the Car. Another device from the consumer market but with a different task. Tracking devices for things of daily use. 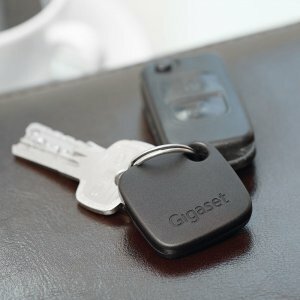 The device itself has very limited logic inside, the only function is to send BLE advertising packets from time to time to allow the mobile app to determine whether a tracker is still in the near neighborhood or not. Another real-life use case for battery-powered IoT is a parking sensor. No, I do not mean the one inside the car to determine the distance between an obstacle and the car. I mean a parking sensor which is placed on the parking slot and detects whether the parking slot is occupied or not. max. +85°C - if the device is used in southern parts of the world directly exposed to sunlight. A battery already serves DC power, there is, therefore, no conversion from AC needed which means, no big power supplies means very small sensor sizes possible. Stay in operation also if main power is off. Labeling obligation and transportation restrictions. Due to the fact that batteries, rechargeable or not, are made to store energy, the energy can also be released very fast (explosively). Therefore devices with batteries must be handled carefully and marked with a specific label to call attention to. Limit in Usage. While not connected to "infinite" power source, battery-powered devices cannot, or only with limited possibilities, fulfill specif scenarios, like data streaming. RF interface is a must. Due to the fact that any cables are missing, a radio-based communication technology must be used. From the implementation point of view RF, technologies requires a specific skills for hardware development as well as for software development. Also debugging possibilities in the field are very limited, and security requirements are higher than with a cable connected solution. Further, RF based device must pass specific certification procedures to be ready for the market. After having a very general look on some of the main advantages and disadvantages, let's focus on some important details which shall be definitively considered during product development. All batteries and accumulators are affected by the phenomena called "self discharge". This is exactly the reason why the accumulator in you camera or your battery-powered screwdriver is always empty when you want to use them. As you can see in the list, lithium-metal batteries are the one with the lowest self discharge rate, but also the most expensive one. For accumulators there are nearly no ways around the Lithium-ion technology. Depending on the use case and product which is in development, consumer grade or industrial grade primary or secondary cells are required. 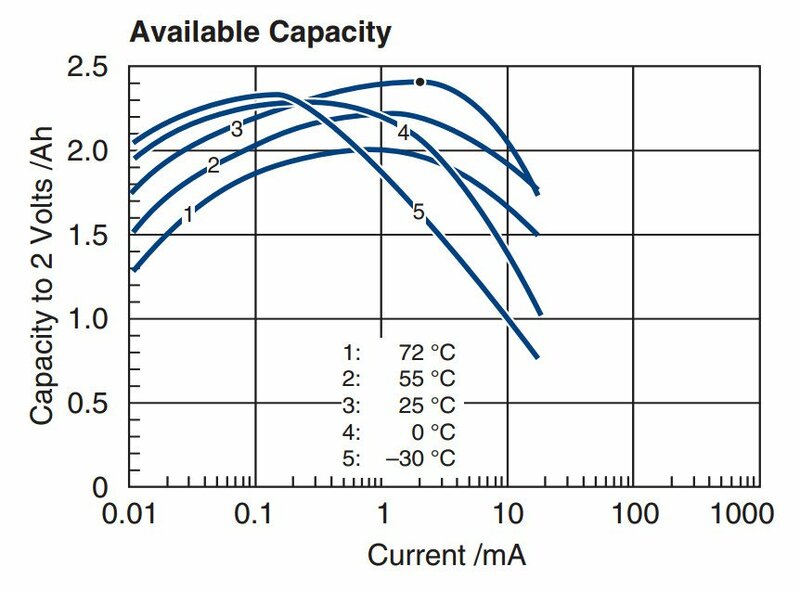 While consumer grade batteries are made for normal temperature ranges and moderate use, industrial batteries can be used in environments with temperatures up to 125°C and secondary cells withstand a lot more recharge cycles then the consumer one. While the consumer manufacturers are well known, industrial are not. Therefor here are some of them I already was working with before. Owners of a mobile phone may observe the behavior by themselves, during warm summer the battery do not last that long. Batteries and accumulators are extremely sensitive to temperature changes. Here we make a turn to the self discharging characteristics of a battery. Below you see a chart of an lead acid battery pack. The chart is based on empirical data. Here is an other visualization. 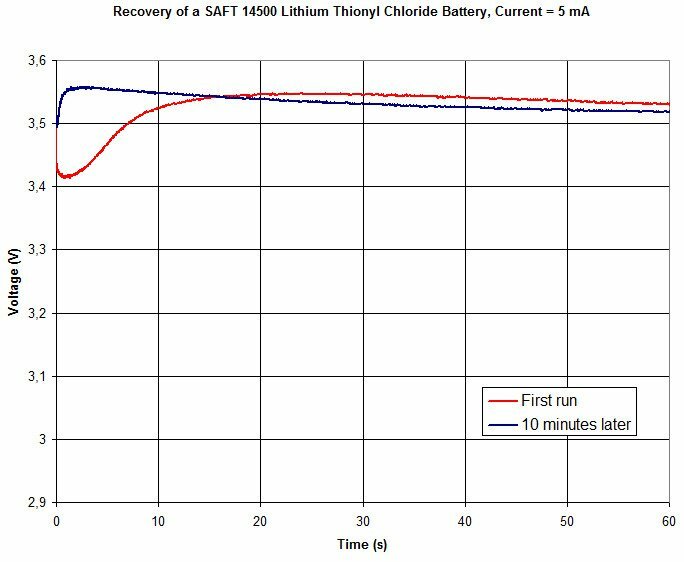 In this case Tadiran SL-500, lithium-thionylchlorid battery, in the size AA was tested. This battery is specified to be used for environment temperatures up to 130°C. 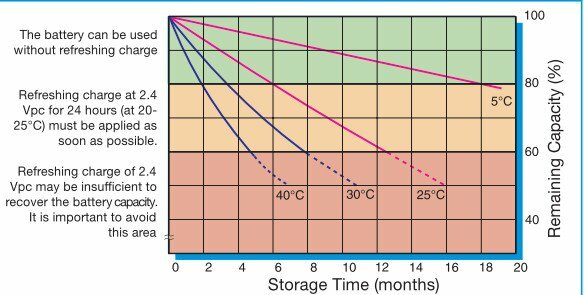 As you can see, high temperatures cause a significant increase of the self-discharge rate and can lead to a faulty battery, leakage of the chemical or even explosions of a battery. Having this information you can imagine that is extremely important to have a good knowledge about your operating environment to have a chance to provide, at least, a guess about the device lifetime. We were talking about the leakage of chemicals and possibilities to explode, this is a good keyword for the next topic. Below is a nice video for a demonstration. I choose intentionally the one with the smallest batteries and not with the biggest explosions to sensitize and not to have a reaction like "our batteries are much smaller, so no reason to worry". But not only the possibility to explode can endanger human lives, also the chemicals inside the battery are extremely dangerous. Therefore during operation of a battery-powered device in food production areas contamination of the production must be excluded. Here are some information about the chemicals inside the batteries. Some use cases, especially in industrial environments, require a maximum and/or static device weight. Batteries weight can vary even in the same margin from one manufacturer. In, non-representative and non-public, tests we had a variance of +/- 10% with AA batteries. Definitive differences exist in between chemical compositions. Passivation is a characteristic of lithium batteries which on the one hand results in very low self-discharge rate, and therefore in very long lifetimes, and on the other hand case a voltage drop if a device was switched on after a long period without operation (without any load on the battery). Below you can see the effect of passivation. After initial switch on (first run), a voltage drop due to passivation effects occur which is not happen during normal operation. The effect restores during long transport or storage phases and must be taken into consideration also during the firmware development. Passivation itself is a very thin, high resistant, film on the anode of the battery. It arises itself and is removed by battery load in normal operation. All this mixed to a complex calculation model allow you to predict the expected lifetime of your device more or less exact. The trick is to find the right balance in between of detail-depth and accuracy. Unfortunately, I can not recommend any template, script or piece of software for this work, just because I don't know any and create them by my own. Tests are an essential part of the product development. Typically every resort performs there own module/unit tests in parallel to the development. As soon as bigger parts are ready, integration tests are done and at the end, the complete system is tested. In the best case, the tests are done with a system which is as identical as possible with the final one. The usage of a battery in the system often limits this test. For example, endurance tests are often performed in a climate chamber under temperatures which indicated the limit in normal operation. The climate chambers one can by on the normal market do not allow tests of devices equipped with a battery, due to possible explosions, therefore the tests must be performed with a static power supply. A similar problem exists also for vibration test equipment. In software tests where a debugger is used, batteries must be disconnected because the debugger typically powers the device under test. Other software tests increase the number or length of messages send through the RF link, this typically reduces the battery lifetime significantly. To keep a good overview in the article I will focus only on a limited number of manufacturers and there on SoC or Module solutions. My expectation is that in a development project a qualitative MCU and Wireless Technologie evaluation is performed to choose the perfect technology for the dedicated products. Further, I will not cover all possible technologies but focus on the most common one. Please be aware that all numbers below are used just to show the difference between the technologies and are not evaluated by me. The real numbers can vary depending on use case, environment, settings and much more. All numbers are rough values taken directly from the linked data sheets. If a value range was given I choose the middle, in the case that RX power was not given I used the TX power. Surely beside the pure power consumption numbers, there are also other factors which have to be taken into consideration like the used frequencies, message size, specific configurations like spreading factors and much much more. All these topics can fill dozens of separate posts with content and will not be covered in the current one. discuss with technicians, FAEs, and engineers not sales. Besides the chosen components also the software behavior is an important part of the power model. Early and detailed planning of the software timings and functionality can show you the problems of the planned system but also save your projects. Do you plan to build a sensing device without any algorithm intelligence? The most important part will be to synchronize the sensing time slots with the communication time slots to prevent burst on the one hand but also not to lose to much power during wakeup and initialization of the bus systems on the other. Do you have the possibility to use optimized subsystems for specific tasks like a sensor controller engine, DMA, behavior driver interrupts while the controller core stays in standby. Make use of them. Do you plan to implement some logic on the device e.g. some algorithms to filter the values or calculate results. Check whether you will need a floating point unit (FPU) for that. Calculate floating point values on controllers without FPU costs a lot of energy. Check carefully the states of all your bus systems (e.g. I2C, SPI) during the development. Are disabled? Measure the power consumption of characteristic processes in the software before each release. Establish coding guidelines for power-save programming in your software team. I don't know about any public coding guidelines but I can imagine at least 2 or 3 projects where some of my routines can be written more efficiently, thankfully these products are not powered by batteries. As already stated in the introduction, one of the main restrictions and disadvantages of battery powered devices is the ecological factor. To produce a battery with a specific amount of energy, much more energy is required than just to get this energy from the normal power socket, the energy balance is higher. But especially the chemical substances, which are a substantial part of every battery, are very dangerous for nature and must be disposed of carefully. Below you can find some directives from Germany and the European Union about the disposal of batteries. The good news, most of the batteries can be recycled if they are disposed of carefully. Clarify whether there is a physical limitation of the device size e.g. due to the installation conditions. If there are no identify the pain point of the customer regarding the device size. This information is very important for the question what type and quantity of batteries can be used and is logically also a precondition for all the other discussions. Here are some examples. Device size is limited due to the common device sizes on the market where 2xAA cells will fit in and the customer request a BLE connectivity with small amount of messages per day and the requirement to have a lifetime of at least 2 years --> great combination there are a lot of ways for optimization in size and power consumptions. With good planning, the size of the device can be reduced significantly where the lifetime will reach 2 years or more and therefore create a USP for the customer. Good sales on your side can sell this benefits to the customer and increase the turnover and profit for the project significantly. Often customer, especially the one which is typically not operating with electronics, do not know about the importance of the maximum temperature. High temperatures can lead the soldering points to get brittle but also your battery to not perform like expected or even be a real danger for human life if it explodes. With maximum temperature over 100°C projects can become unrealistic, depending on the other requirements like device size, limits on stored energy, long lifetimes, explosive environments, restrictive BOM costs. Do not accept specifications like "from 0 to 60 °C most of the time" ask again and again for a detailed profile. Often the customer does not know about the battery behavior at different temperatures. Invest some time and create a calculation model to visualize what it means if you assume only the worst case scenario due to the fact that you do not have a detailed one. In this case you have definitive numbers you can test against and dependencies to any other metrics. And you can also create a more accurate lifetime calculation model for your customer. This is often the wrong conclusion of people who do not work with electronics and is not interested in this area at all. By the end of the lifetime, the battery still contains electrical energy but the voltage is low to drive the electronic components which require the voltage being in a specified range. For some application an totally empty battery is beneficial for this purposes, a specific circuit must be planned and designed to convert all the remain energy in the battery in e.g. heat. Every day we use battery-powered devices, smartphone, laptops and much more, which show us an accurate battery level indication, at least this is our expectation. Often this expectation is transported also to IoT device development. Here is some shocking news. Pure voltage measurements can just give the information whether the battery is ok or already bad. There is nothing in between. For IoT device, there is often no energy or space available to implement an additional logging feature to calculate the remaining time. On the other hand, many factors, like temperature, current consumption etc., influence the current battery load and the remaining time. 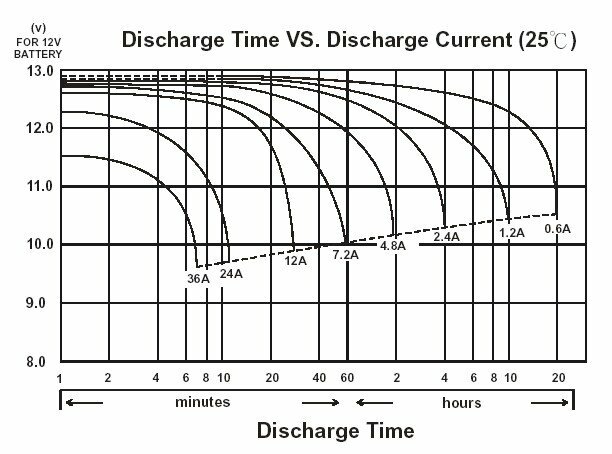 Below you can see the typical battery discharge curve for a 12V battery independence to the current load at a constant temperature. As you can see the graph is very flat the very first time an falls rapidly as soon as the battery reaches the end of life. The abruptness of the transition point increase with the current load. In a battery powered device the goal is to reduce the current consumption which brings you to a very flat graph over the complete lifetime and an abrupt voltage decrease very close to end of life. Ask your customer about the expectation, explain the limitation and physics. Like stated in the section about the communication technology affects the battery lifetime significantly. Ask the customer about the main use cases instead of specific technologies and propose a solution based on objective figures and reasons instead of "someone said something facts". Example: often, if the task is to get the information from a big number of devices, BLE technology is excluded due to the "pseudo fact" that it can not be used with more then 7 devices, it is partly true. 7 devices if they are connected simultaneously to the master. But if devices wake up from time to time just to send some bytes of data, you can connect multiple thousand devices to one master ... theoretically as well as practically. Take a realistic discussion with your customer about the lifetime, show him the physical limitation due to the requirements, environment, market, technology etc. Provide a detailed lifetime calculation to support your expertise and show ways where the solution can be optimized. Clarify if the device shall live exactly as long as the battery or the battery shall be replaceable. The decision give the project more or fewer possibilities or limitations. Clarify if maybe the device can be recharged. Rechargeable batteries often show a better voltage stability and have a better energy balance. The decision give the project more or fewer possibilities or limitations.